The Studio Music and Jazz Instrumental Performance Masters Degree Program seeks to prepare students as both individual and collaborative artists equipped to enter the competitive, entrepreneurial landscape of modern jazz and commercial music. The curriculum emphasizes training of the total musician, with coursework in composition, arranging, improvisation, history, technology, and pedagogy alongside private study on the major instrument. Master’s students have the opportunity to work with Frost’s outstanding faculty in both classroom and private lesson settings. Students obtain performing experience in a wide range of small and large ensembles and participate in numerous highly visible public performances. Students have many opportunities to record as both performers and composers in the Studio Music and Jazz Department’s own recording studio, as well in three other state-of-the-art studios on the Frost School of Music campus. 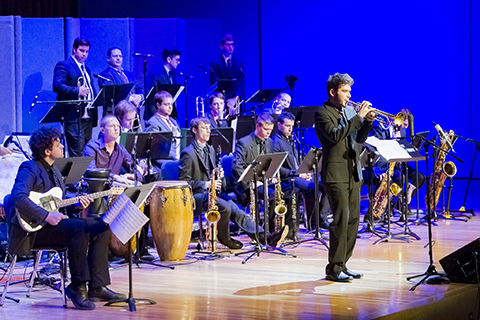 In addition, jazz students often collaborate with students in other majors, including media writing, music engineering technology, and contemporary performance. Miami’s vibrant, multicultural music scene offers a wide range of performing and listening opportunities off campus as well. A large jazz instrumental faculty ensures an extremely low student teacher ratio. Classes are small and faculty members are on campus and actively engaged in the daily student experience.